A vejigante costume is a 3 part costume. The suit and cape are usually made using fabric scraps so . . .
use different pieces of fabric in assorted prints and textures. The mask must have horns, snout, and fangs. Cape - Find a halloween pattern that includes a hooded cape. The cape is short to the elbowls only. It needs to have strings around the neckline to hold the cape in place. Adorn the cape with ribbons, sequins, bells, etc. Suit - Find a clown-like suit with fabric between the arms and body all the way to the ankles. Skip the extra fabric from the arms to body if you want to. Make sure to use different fabric prints and textures, patterns, etc. on the different pattern pieces. 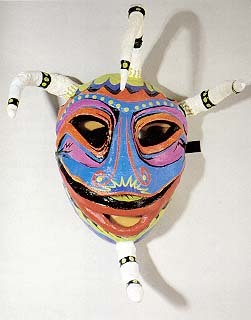 Mask - The traditional vejigante masks have multiple horns, pointed teeth, and large snouts. Traditionally they are painted with bright primary colors. Mask. Use a round 9" balloon. Inflate it and cover it with paper mache using strips of newspaper dipped in a ½ glue, ½ water solution, cover it with two layers. Let it dry. When dry (the next day), cut the ballon in half (lengthwise). You will use one side for the mask. Use your favorite method for mask making - you can buy forms ready made. Eyes. Measure where to cut out eyes on the mask and mark them on the mask with a marker. The shape and size of the eyes is up to you. They should be centered and not too far apart. Cut the eye holes by using a blade and then small sharp scissors. Try it on to make sure you can see out of it.Snout. Make a pointed rounded snout by folding paper, taping it secure with masking tape, and taping it to the mask. The snout will later be covered and secured with layers of paper mache. Horns. Make different size horns by folding paper to form a flute, tape it closed, and then tape each horn to the mask (always use masking tape when working with paper mache). Make 3 horns, 2 around the forehead and one from the chin (the chin horn should be shorter). When the horns are covered with paper mache they will be moist and flexible and can be curved. Ties. Cut small round holes on each side of the mask, same level as eyes, to run ribbon for holding the mask in place. You might want to cut a third small hole on the top of the mask, that way it will sit more securely with 3 ribbons around the head to secure it when worn. Mouth. You have the option to simply draw a mouth and paint on the fangs. If you don't mind extra work - go ahead and cut out a big scarry looking mouth. If you cut out a mouth you will need to add fangs made out of baked clay or something else that is hard. Now that you have your basic mask with eye holes, snout, and horns, add more layers of paper mache just enough to cover the horns, and snout and all the tape you used (make sure you don't cover the tie holes). Don't put too many coats because it gets too heavy. Let the mask dry again. Once the mask is dry go, ahead and paint it to your heart's content. Remember to use different colors on the mask. You might want to paint a fierce mouth with fangs (traditional). You might want to paint white around the eye holes. Wait until the paint dries and spray it with a sealer. Try to complete the mask a few days ahead so that it can air out and there won't be any fumes. When the paint is dry, run ribbons through the holes. 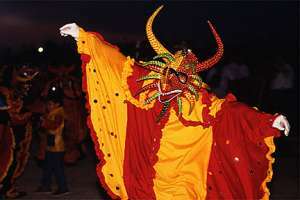 Some masks are additionally adorned with strings of ribbons hanging from the horns. You can use some curling ribbon. Tie bells to the ends of some of the ribbon. Leave it to your imagination - have fun and be creative! At this site you can order student books, and a video that will make a perfect and complete lesson plan.